The education people receive and the skills they attain greatly influence their economic well-being, but successfully navigating the labor market is no simple task, and understanding the history of eastern Idaho’s labor market, its current growth and the specific industries that are growing can make it easier. After several years of slow growth, the U.S. labor market appears to be picking up. The U.S. Bureau of Labor Statistics reported a 295,000 increase in February’s nonfarm payroll employment, marking the 12th straight month payrolls grew by more than 200,000 – the first time since a 19-month run in 1993 to 1995. Idaho’s economy has seen significant improvement in recent months. Employment rose nearly 4,200 in January, the largest one-month gain in more than 20 years. That pushed total employment to a record 746,600. Idaho’s performance was even better in February, adding another 5,000 jobs to set a new one-month record that pushed total employment over 750,000 for the first time ever. Unemployment fell to a seven-year low of 3.9 percent, marking the 68th consecutive month since Idaho’s unemployment rate has increased. 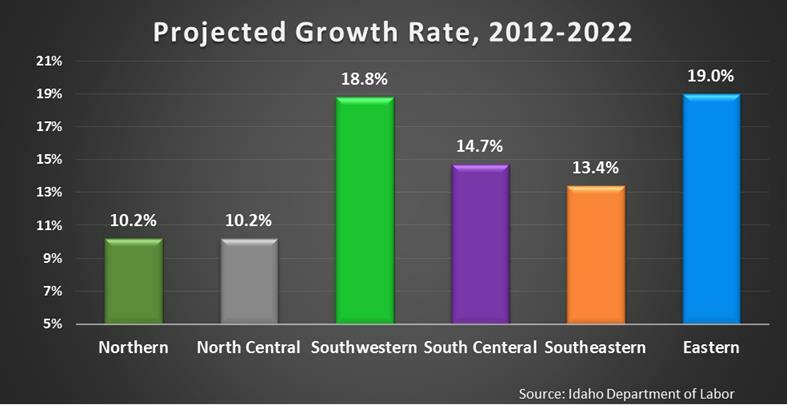 Projections by the Idaho Department of Labor indicate the downward trend is likely to continue. Every two years, the Idaho Department of Labor releases projections of what the economy may look like in 10 years, and the most recent projections indicate Idaho’s economy will not only grow but at an impressive rate. From 2012 to 2022, Idaho payroll jobs are projected to grow 16.3 percent – 1.5 percent annually – to add over 109,000 jobs to the economy. This completely outpaces the performance of the previous decade’s growth. From 2002 to 2012, which was largely influenced by the recession, job growth was just 5.8 percent. Eastern Idaho should see a significant portion of the 109,000 jobs being added by 2022, mostly due to the resources at the Idaho National Laboratory, the proximity of Idaho State University and Brigham Young University-Idaho, major transportation routes through the region and the technical training capacity at Eastern Idaho Technical College. Based on the Idaho Department of Labor’s projections, eastern Idaho should have the largest percentage increase in jobs of any region – 19 percent followed by southwestern Idaho at 18.8 percent, south central Idaho at 14.7 percent, southeastern Idaho at 13.4 percent and northern and north central Idaho at 10.2 percent. Construction will see the greatest growth at 53.4 percent. Much of it, however, can simply be attributed to restoration of jobs lost through the recession. From 2007 to 2012, construction jobs disappeared at a staggering rate of 47.3 percent – a loss of 3,300 jobs in just five years. Even if the construction industry met the projected growth today, jobs in that sector would still be more than 1,000 below the 2007 peak. Transportation and warehousing should post 39.1 percent growth followed by health care at 22.6 percent, which will be mostly driven by growing demand for medical services from Idaho’s rapidly aging population. In all, eight of the region’s major sectors are projected to grow over 20 percent and another six more than 10 percent. Mining is the only sector projected to shrink, dropping 9 percent most as a result of the announced closure of the Thompson Creek Mine near Challis where operations have been suspended and 200 workers idled. Over the past 40 years, eastern Idaho has seen a dramatic swing in its demographic makeup. While Idaho is one of the youngest states in the country with a median age of 35.7 years, Idaho has ranked 16th for fastest aging populations since 2000. With abundant recreational opportunities and a relatively low cost of living, Idaho has seen a steady increase in migration by those at or near retirement. With eastern Idaho’s aging population, jobs in health care have the highest projected net job growth of any industry in the region, and as the population continues to age, the demand for health care services will just keep growing. In fact, four of the five industries with the highest projected growth rates are closely linked to the aging population. Along with health care, retirees demand services in retail trade and in leisure and hospitality. Even construction will be influenced by increased demand for newer residential housing for incoming retirees and for new commercial buildings for the services they need. The top five industries with projected growth over 1,500 jobs are health care at 2,314; retail trade at 2,041; professional, scientific and technical services at 1,988; construction at 1,977; and leisure and hospitality at 1,544 jobs. Professional, scientific and technical services is the only sector where growth is not tied to population shifts. It is linked to the Idaho National Laboratory and its high technology spinoffs such as Intel Security. That company recently moved into to a state-of-the-art facility in Idaho Falls and expects to employ up to 150 computer programmers and security software engineers by the end of the year. As the economy continues to grow, capitalizing on future opportunities becomes the challenge. Knowing which occupation or job to pursue to take advantage of growth can be difficult. Clearly not all jobs are equal. Some offer better career paths than others. To provide possible direction, the Idaho Department of Labor has evaluated and ranked each occupation to determine which are “Hot Jobs” – those that are the most abundant, growing the fastest and have high average wages. Occupations in health care, construction and professional services dominate the top of the list. Each scores well in both base and projected employment with pay well above the region’s median wage of $14.09 an hour. With so many jobs expected to be added to the economy, eastern Idaho’s economy appears to be in for a boom, and as the economy grows, people’s ability to capitalize will depend on their skills. This entry was posted in Employment News and tagged Christopher St.Joer, Eastern Idaho, hot jobs, idaho department of labor, idaho economy, jobs, Projections on May 2, 2015 by Idaho Department of Labor.